Thai Salad recipe by Rehana Nadeem at PakiRecipes.com. 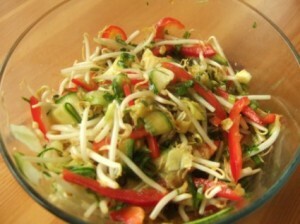 Simple and easy recipe of Thai salad that makes an delicious appetizer for parties. Mix all dressing ingredients in a bowl and cut fruits in any shape. Boil and rinse pasta mix all and serve cold garnish with chopped almonds . yeh kounse thai salad hay bhai!! !it seems more like a fruit salad..